Panel from a recent episode of "The Simpsons"
To countdown to the New Year, I wanted to highlight a really interesting document I just discovered: a list of complaints filed with the FCC against “The Simpsons” from 2003-2007 FOIA’d by GovernmentAttic.org. Apparently there were so many the FCC charged them extra for copying fees. Props to Timothy Sexton for blogging about them. It is hosted here and really worth checking out if you want to see what our cultural gatekeepers navigate all day, or you have a sense of humor, or if you know how unusual it is for people to lodge a complaint. 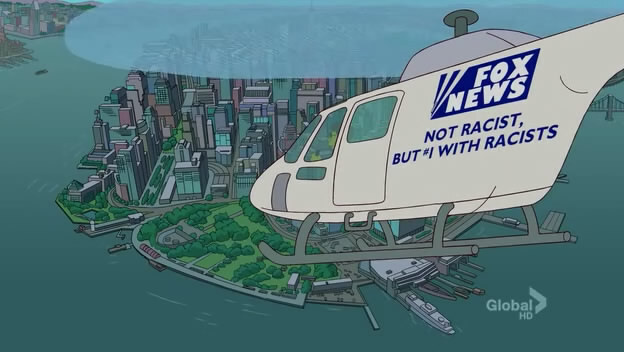 What’s ironic about it is that criticism of American media (and specifically television) is one of the most wonderful things about “The Simpsons”, which takes a pretty unflinching media-justice stance on everything from product placement to the personalities and proclivities of its own network (FOX). One episode even shows Marge organizing a protest to reduce cartoon violence on the Itchy & Scratchy Show, which Bart and Lisa then refuse to watch. Harry Shearer, who voices Flanders, Mr. Burns, and half the other characters on the show, is a media critic in his own right, detailing on his column on Huffpo the inaccuracies in media coverage of Hurricane Katrina and the effects in his hometown of New Orleans, a mini-jihad against NPR censors, and other interesting stuff. Problem ID: PROBLEMOI096190 Consumer’s Name .••;….. I want to complain about the episode of The Simpsons that aired directly after the Superbowl on Fox. The episode was depicting the story of Cain & Able. It was extremely goory & disgusting and it clearly showed someone being stabbed with blood squirting out & blood dripping from the knife that was used. This show was totally in poor taste, especially when there is a high possibility of children still being around the tv.